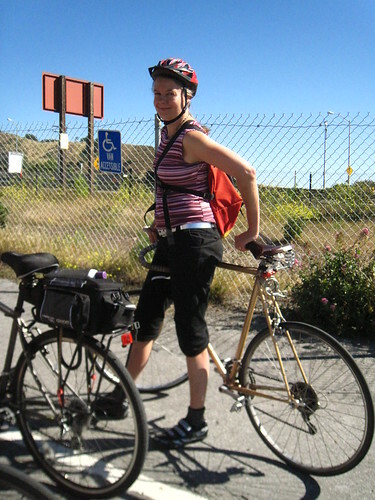 Have you heard of Bike and Build? Who Can Hook Me Up? 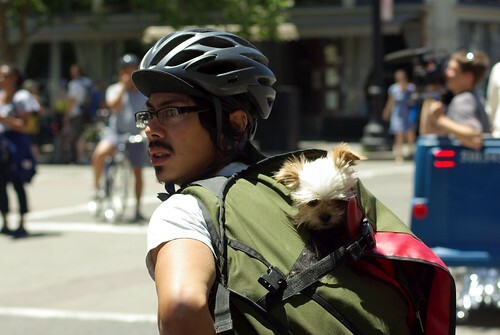 While riding around the lovely closed streets of Downtown Oakland this weekend, I ran into this cute guy all wrapped up in wood. 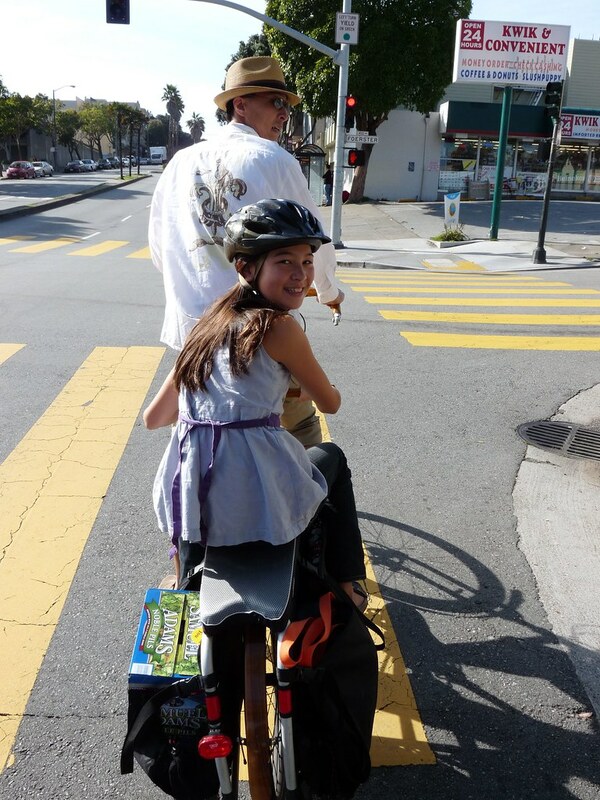 I noticed he was riding a bamboo bike, as was his friend, and they had a whole bunch of bamboo tubes with them. 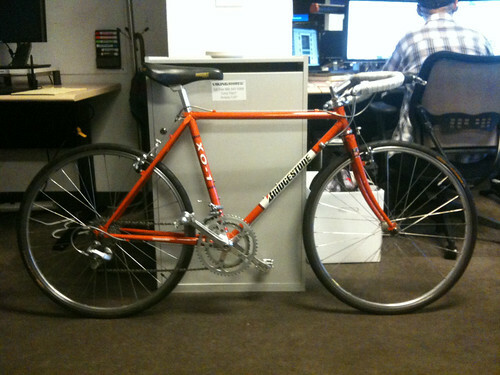 So, because I am nosy as hell, I asked if they built their bikes. They did! 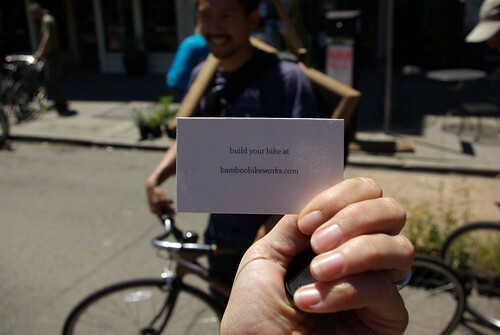 They are the guys behind "Bamboo Bike Works" in Oakland. 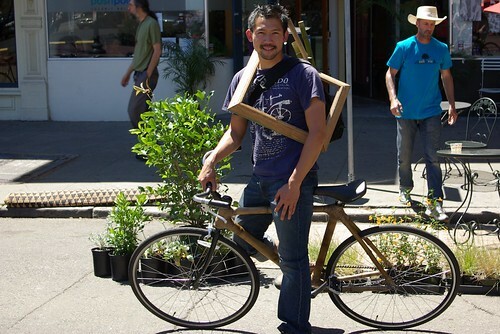 They provide the materials, space and instruction to get you making your own bamboo bike over the course of a weekend. Now, I like me some DIY and I have tried to contact them in the past (didn't realize it was the same guys when I ran into them) but their website won't let me email them. It has one of those silly numeric verification systems and it keeps telling me that 19+5 does not equal 24 and thus will not pass on my message. So, if anyone out there knows these guys, I want to do a story about their classes and take some pictures and maybe even make a bike. Hook me up, people! There is free advertising here just begging to be used!! The closing of streets to car traffic for a few hours from time to time is getting more and more popular all around the world. 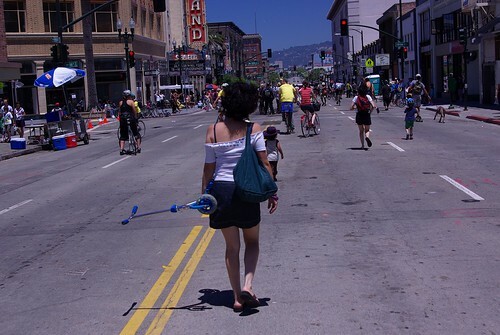 San Francisco has had the ever more popular Sunday Streets for the last few years, and now Oakland has Oaklavía, which debuted last Sunday. The event had to compete with the 40th Anniversary of San Francisco's Gay Pride Parade (among a whole bunch of other things like a Giants/Redsocks game, the Mexico/Argentina match...) Despite the absolutely stupid amount of things to do this weekend, there was a good turnout for the lovely, quiet streets of Oakland. 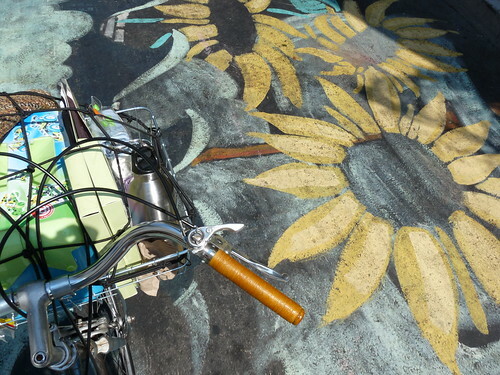 It is not terribly surprising, after all, when you get rid of the cars life springs up everywhere! 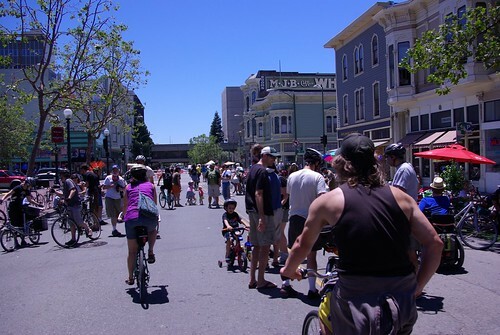 What was great for me was that it wasn't super packed so I could appreciate all of the people and the thing that makes Oakland a really great place- the diversity and openness of its citizens. I took a whole bunch of pictures which will take me awhile to edit. Check in to the set in a couple of days to see what comes up! I wish I could do panda's this good! "Sweet Olive" always shoots great pandas, but this one is my favorite. Can you do better? Give it a try and send it into the Flickr group! We have talked about it before, the Wednesday Night Butter Lap. 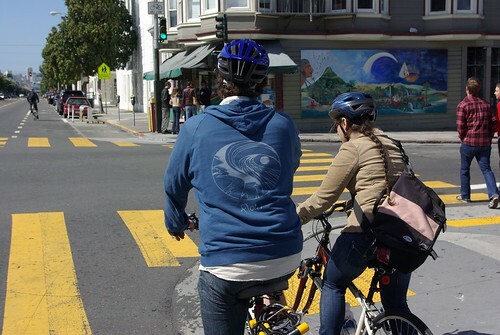 It can be a pretty strenuous ride if you are not ready for it, and a lot of people show up for it thinking it is strictly a social ride. It is social, but the comradery is based quite a bit in the challenge of the hills. Not everyone loves the freedom of a long, steep, fast fly down the side of a mountain in questionable light (my favorite part!). 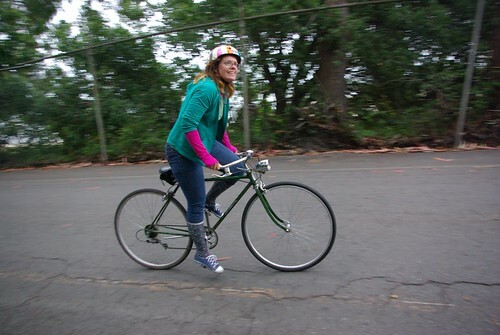 That said, if you do come out for the ride, and you can appreciate the challenges, Butter Lap is a blast. Leah just moved here from Austin, TX and this was her first Butter Lap. One of the first things she said to me was "Austin is flat". I know how she feels. The first few times I did this ride I had to work super hard to finish. Sometimes all you need is a little encouragement and someone who knows the way to stick with you. Most of the time, that is all you need. I wasn't in a hurry so I decided to stick with Leah so she wouldn't get lost and she would know how much farther there was on each hill (it helps so much just knowing how far you have to go and I almost quit after being left behind in the past). We had a great talk and I was super happy to see her get to the end of the line. I hope we see her on the ride again! Then there was Amanda. I didn't get a good shot of her face. 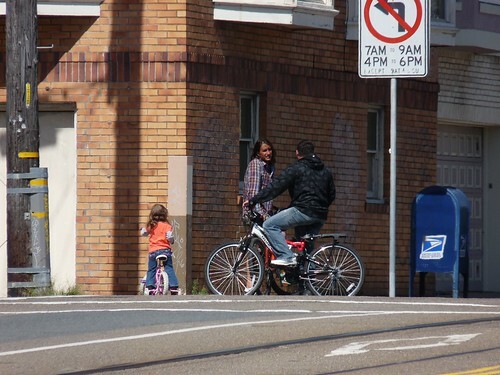 Her bicycle was in terrible shape, and wasn't shifting at all. James (yay, Hubby the Bikeman!) took a look at it and was able to get her a few gears. Despite the fact that she wasn't used to the hills, her bike was stubborn and she kept dropping her chain, James stayed with her. Amanda declared him to be her new "Bicycle BFF", which he is to everyone and is why I love him. James likes to jam up the hills and is very competitive with me about who gets down them faster (me, BTW), but he stayed with her the whole ride to make sure she didn't get left behind and she made it all the way to the end. It took some work, too, but she didn't give up and I was really proud of her for sticking in! 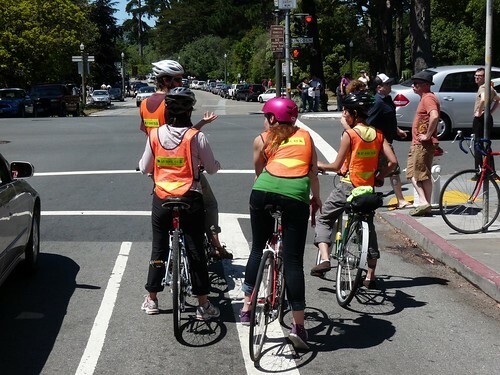 Group rides can be a whole lot of fun, but if one of the riders struggles or is slower, group riding can be frustrating. Never being able to catch up, not knowing the route and not knowing how to pace yourself can wear a rider out way faster than any hill or headwind. Just having someone stick with you, or ride back to check on you from time to time can be the difference between being happy to be challenged or quitting and never coming back. It is so easy to get caught up in the ride, but if we all remember the riders, the ride gets so much better! Do you like group rides? Have you been too intimidated to try one? A couple of weekends ago we went on to a ride up north of San Francisco. 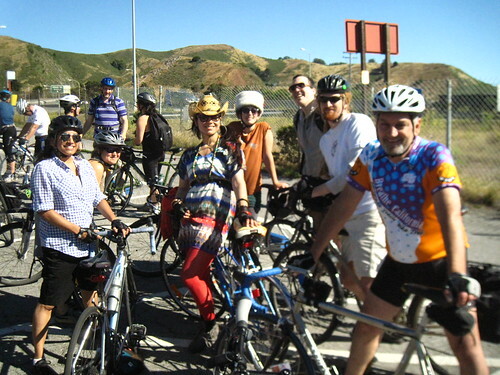 We were ready to ride at 8AM on a sunny Saturday and we all joined the now annual Fairfax Foray. 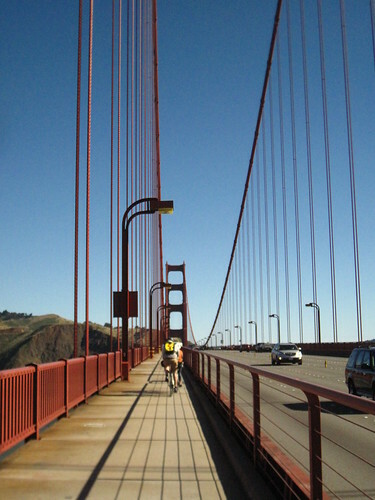 For those of you outside the Bay Area, the weekend mornings at the Golden gate bridge are hectic if you are on a bicycle. Not because happy tourists attempting to capture a memory of a majestic beautiful icon. Not because of our splendid mid 50° degree summer fog. Not because of our views. Yes, as locals we can never get tired of that. 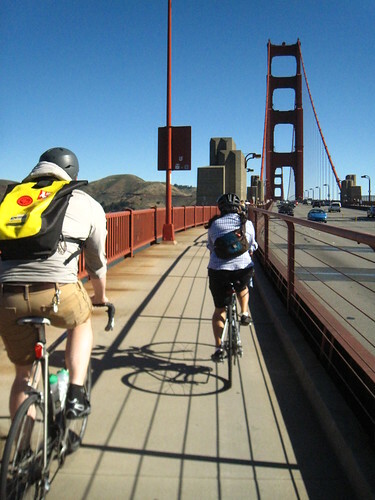 But there is something that happens on the north end of the bridge – the lycra bullies. The verbal abuse the daily, normal, typically everyday people like me and my peers, and perhaps most of you that read this blog, get on this bridge on the weekend mornings, is certainly abusive. 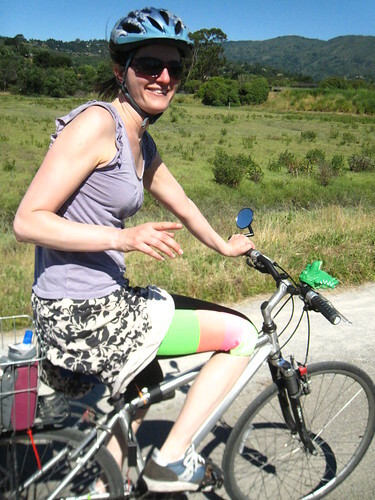 I have always say I have met nice folks with full-on lycra that are very nice and sweet. 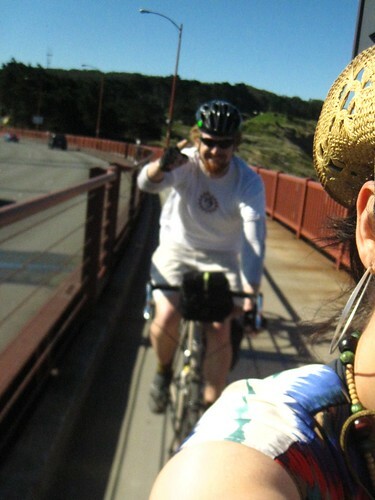 That does not apply 90% of the time when I happen to be with my friends, on our-OUR Golden Gate Bridge. So here to share, some of the things that I overheard within 2 minutes. Mind you, as the photos below show, the bridge was rather calm. Too bad we intruded for these people, to shave 3 seconds of their time and some use of their bitter spit, to let us know what idiots we are. "Stopping in this spot is DANGEROUS"
"Move out of the f***ing way"
"Riding bikes on the bridge is very dangerous"
I just have to laugh, and ride. These *ssholes that go out of their way to insult us are plain out lame. Do I see them riding butterlap everyweek? Do I see them dodging doors day in and day out throughout the city on a daily basis? 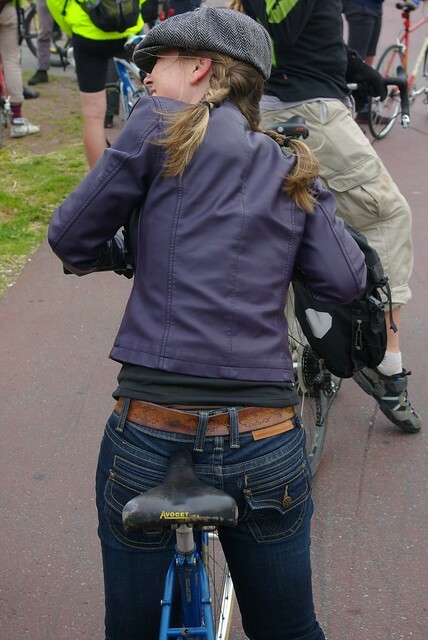 Do they have fenders, because when you RIDE so much in the city, you *know* that was urine? 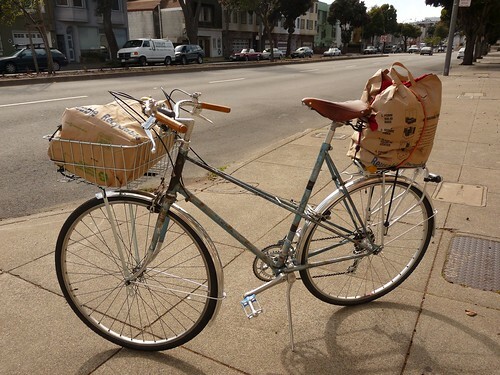 Do they haul their fancy road bike up and down Bart, Muni, AC transit or CalTrain because they commute, went to a party, or are so tired after you went bike camping 100 miles away from here that you are just trying to get home? So who are the idiots now? 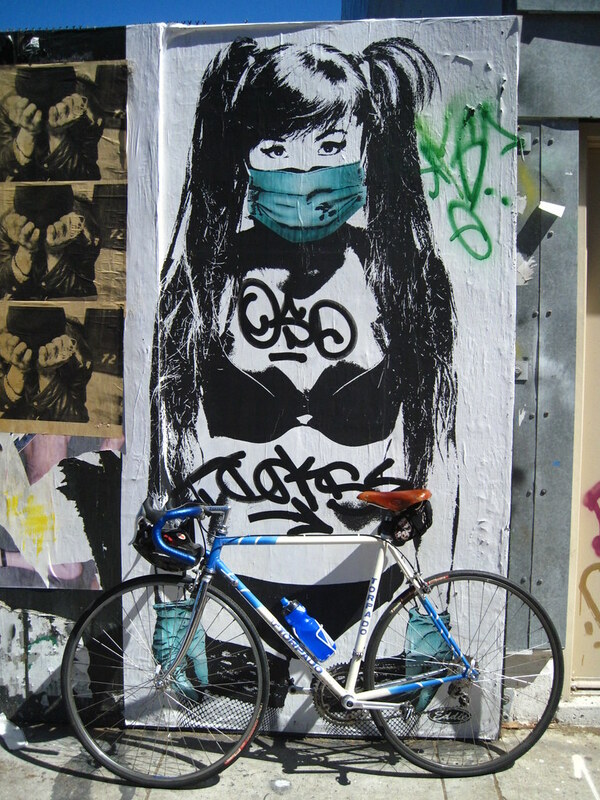 We continued our ride, we can put up with the daily hussle in the city - these posers on lycra don't intimidate us one bit. Suckers. 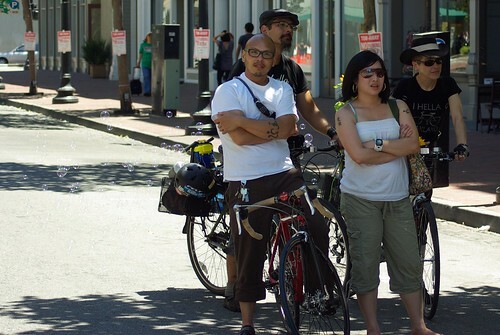 They have no idea we rode to Fairfax, (about 18-20 miles up from SF) looking freaking happy and had a blast. There is no heart monitor to measure that nor energy bars to put up with us. Of course, there are a handful that as fast and mean as they look, take a sec of their bridge experience to say normal things, like 'oh hello' or 'good morning'. To remind you what idiots we are, here are some pictures of our ride. Thanks for insulting, but try again later. 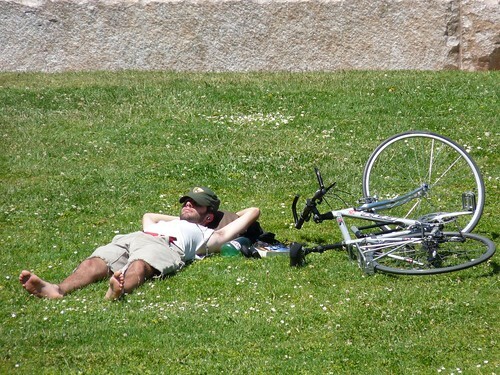 Summer In SF. Pull On The Wool! When we left the house it was cold!!! Damp, windy, cold. 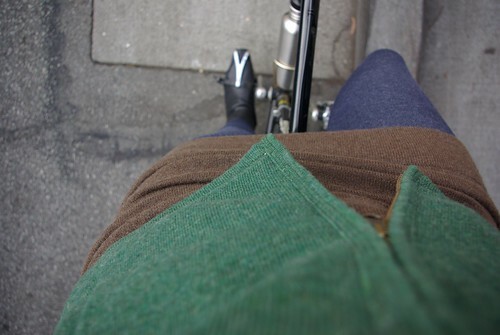 Despite being the third day of summer, I had to pull out the warm clothes. Wool hat, wool socks, wool vest, cashmere turtleneck. Boots! It is SF, and I have lived here my whole life so I should be used to it... but really? At the end of June? I think I think this same thought every year- who needs this much clothing in June in California, for peet's sake? More on this ride tomorrow. We had a special guest from down south in for the ride and some super cute new riders and for once I got some good pictures of it all!! 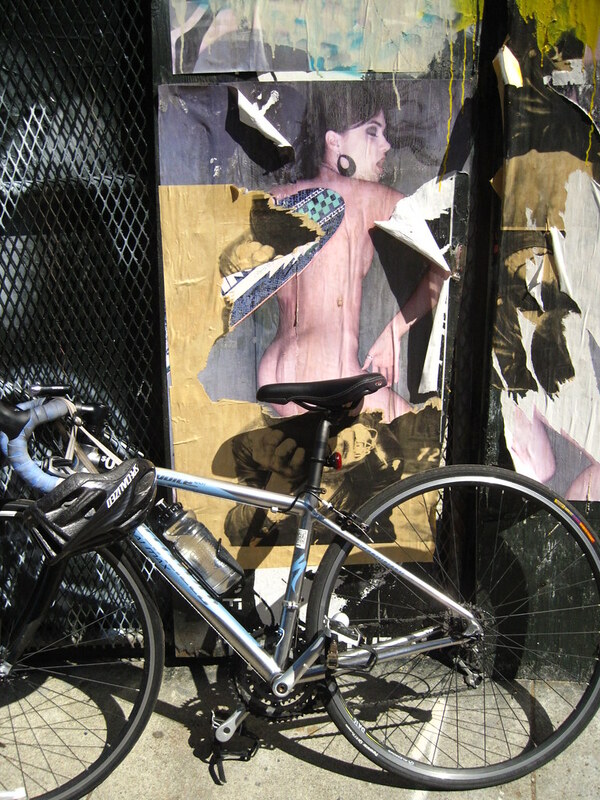 Calitexican and meligrosa's road bikes getting some spanking fresh artsy wall love. Right. For once we left our beloved basket red and bleu mixtes asides, and we decided to take our road bikes for a quick spin the other day. (that quick turned out to be, ummmm, 3-4 hours...) And face the mean hills in the face. Y qué?! here we go. Of course I could not agree to do anything, for that fact, without a serious caffeination session before hand. More to come soon. 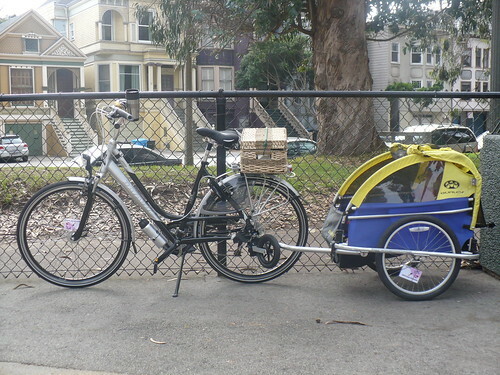 Both photos taken on Linden – Hayes Valley. 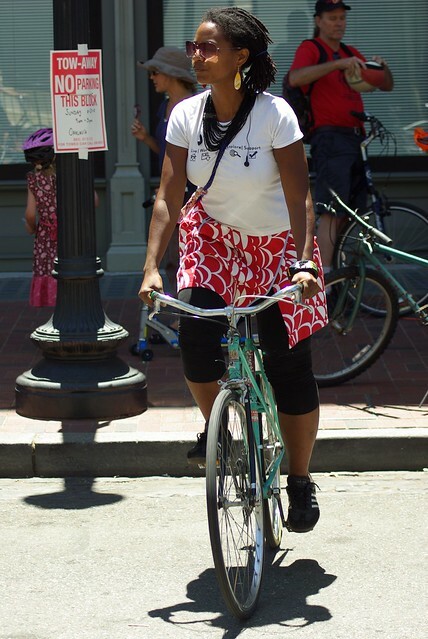 Why do you ride a bicycle? That is a pretty common question, and there are a lot of answers that you can give. I suspect that in most cases, the reasons change pretty frequently. They do for me. 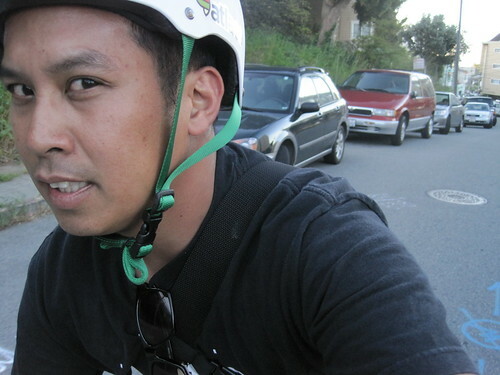 I like to do things on my bicycle that others need minivans for. I like spending time with my family doing something purposeful and fun. Today, though, I ride because the Gulf of Mexico is being chocked to death. 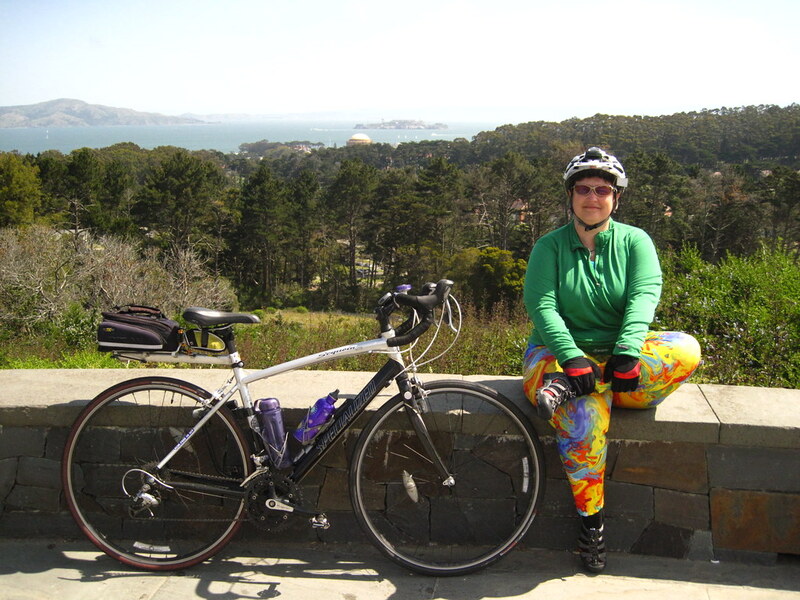 I ride because there are whole swaths of the ocean that have no oxygen. I ride to try to change my own life so that I am not contributing any more than necessary to the disaster that oil and power and corruption and greed and ignorance and apathy have in killing the Gulf. Why do you ride today? Another weekend has come and passed and I have nothing pithy to write about and not enough photos dealt with on any one subject to cobble something together with. So I'll just throw up a few random shots of happy bike life in San Francisco from last weekend and try to do better tomorrow. 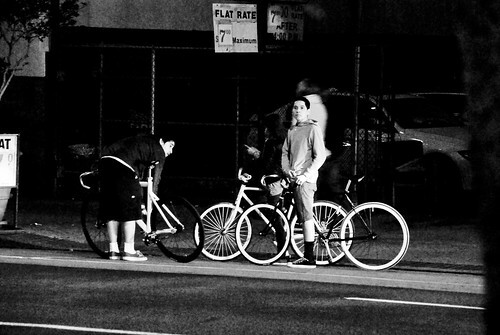 Bicycles in front of cafés is pretty much the "fish in a barrel" shot in these parts. 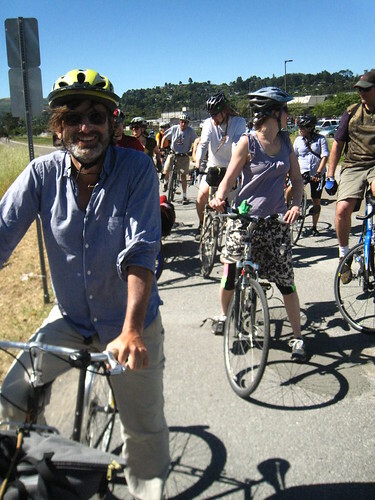 The City was awash with adult Bike Ed classes from the SFBC. 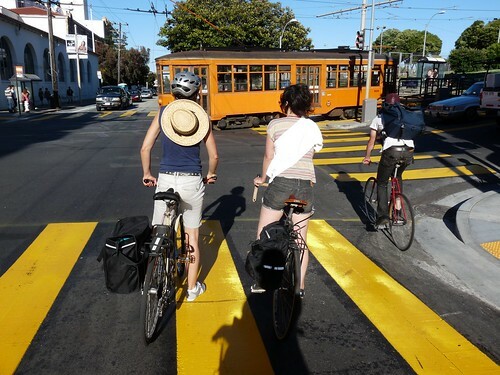 It is easy to stop at intersections if you get something interesting, like one of SF's historic trolley cars, to watch. 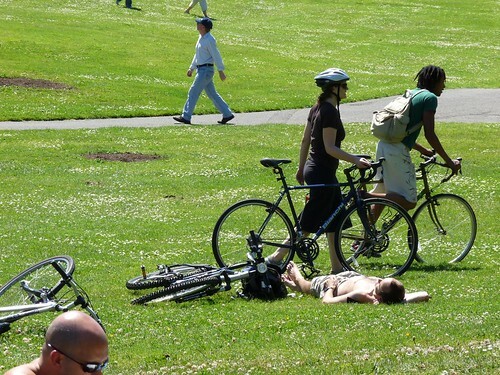 When the signs say that bicycles are not allowed on the path we try our best to comply and head for the lawn instead. 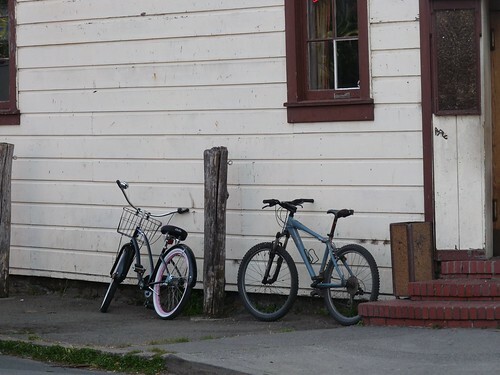 And if it all gets to be just too much in the City, we can head to Point Reyes and leave our trusty steeds outside while we get a beer. indeed my size. I got excited! Emailed him back… And emailed again… And again… Yet again… Nada. the bank and by lunchtime I was an XO-1 owner. tell me to take the lane! Ha! 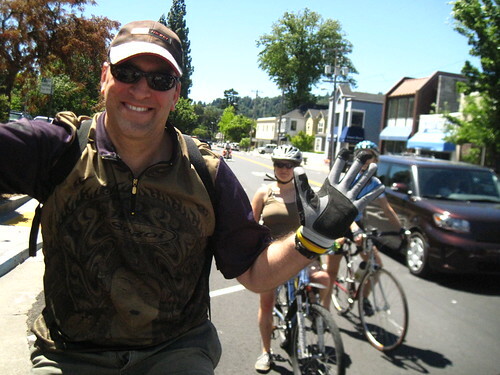 Thanks Change Your Life Ride a Bike for letting me write about my experience. on the first day of the world cup, KT and i met up at a cafe to watch the mexico v. south africa match. they didn't have sound at the cafe, so we relocated to the irish bar nearby. oh did they have the sound. and lots of south african fans. errr..? England vs. England - Si Se Puede from Kristin Tieche on Vimeo. as you know, that game resulted in a draw. BORRRRRRIIIIIING. but not yesterday! stay tuned for more world cup updates...as that is what i like to do in the mornings. 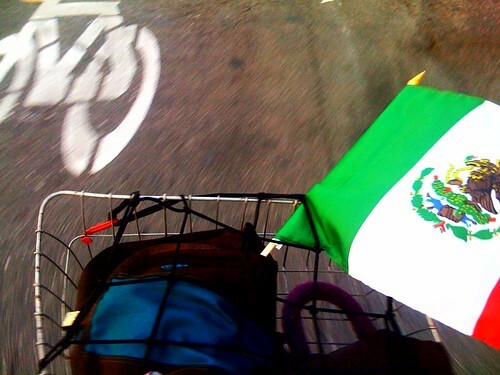 bikes and futbol. what could be better?! You have nothing to lose and some nice stuff to gain! Go do it! cruising down market street approximately 6pm. 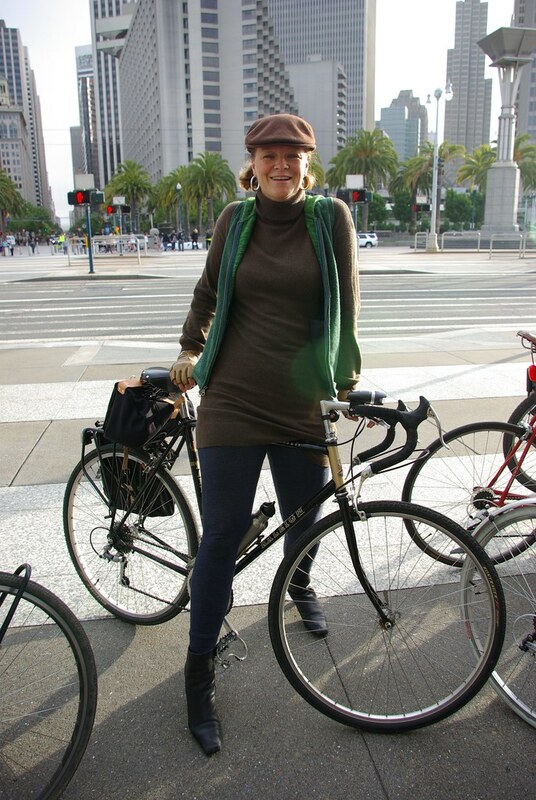 I photographed Lynne and her Specialized on May 8th in the Presidio. I have the Pinhead key as well as the original purchase paperwork to prove ownership. Reward and my undying gratitude if recovered. So it turns out the "Change Your Life. 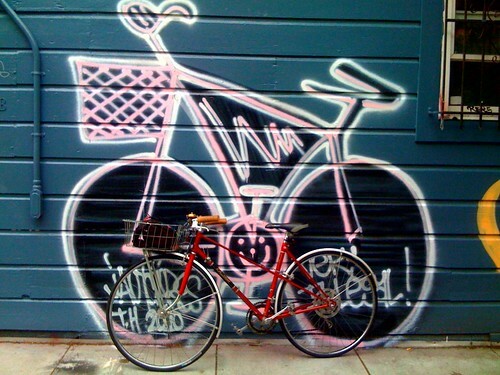 Ride A Bike!" is over a year old. Our first year has come and gone, and in true Meli/Cali/Caryl/Adrienne style, we were all too busy going to cafés and breweries and taking pictures of people to notice. As they say, better late then never, so we'll just tip our hat to our birthday now. 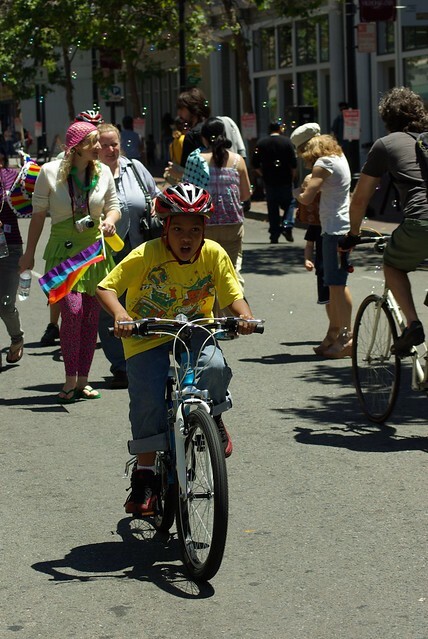 This last year has been a transformative one for the bicycle world. 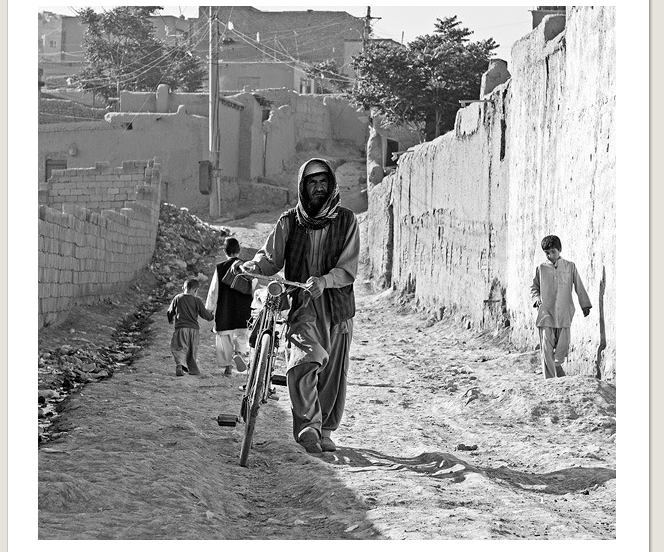 So many more people all over the world are embracing the idea of a bicycle as a part of everyday life. 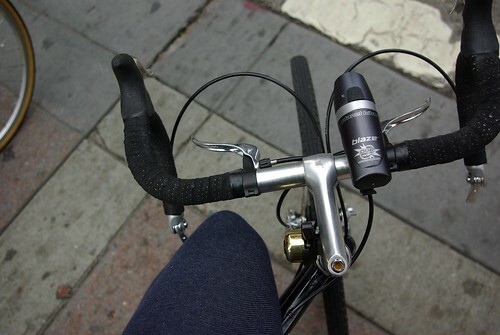 Bicycle companies are starting to understand the need for bicycles that everyday people can use for everyday life. 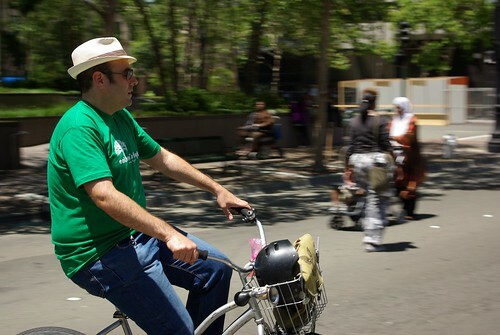 Bike shops are booming, bike blogs are proliferating, bike lanes are popping up. 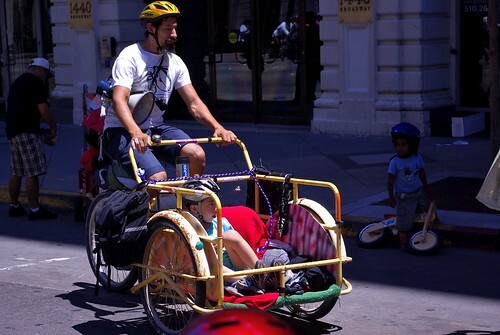 The way we all think about transportation and personal ability is adapting. I hope to speak for all of us here at the blog when I say how honored we all are to play whatever small part we do in the whole process. 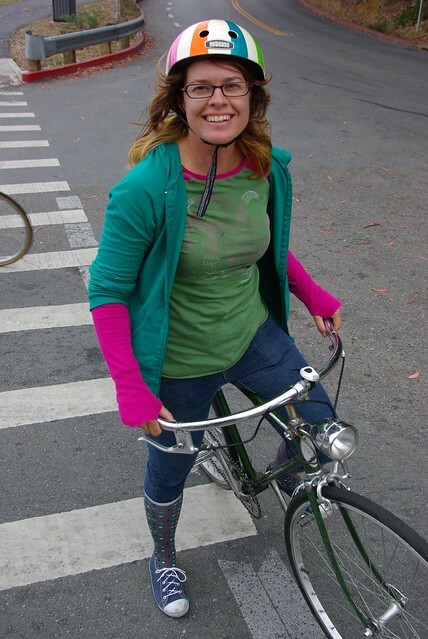 We started this project to highlight the people of this next generation of bicycling, and it is safe to say no one has ever learned a damn thing about chain rings on this blog. This is what I am the most proud of when I look back at this last year. 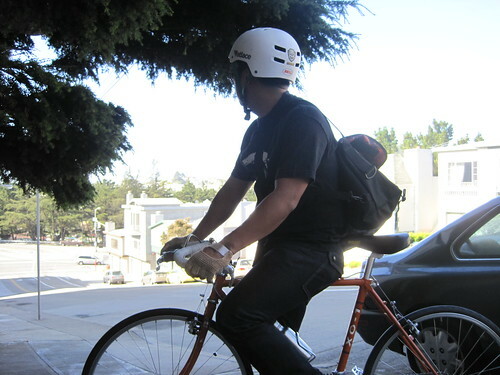 The connections that our bicycles and our keyboards have made (not just ours, but all the bikes and blogs out there) are what will ultimately help bring the changes we want to see in the world. If this last year is any indication of our future, then this next year will bring some amazing things to experience and write about. So stick around to see what comes next. I have no idea what it will be, but the four of us are pretty good at making fools of ourselves whenever there is a slow news day, so I am sure we will have something to entertain you! i was talking to someone earlier today about the name of my red bike. if you watch mad men, you know that this character's name is joan. if you watch mad men, you know this character's name is roger. roger's nickname for joan is "red." and i guess roger, or rather the actor who plays roger, john slattery, rides a bike while holding what appears to be a script. meowwwrrrr. oh heeeeey there roger. nice bike. Stick It To 'Em, Thom!